Where were the inhabitants of ancient Salamis buried? As the site was occupied for nearly two thousand years, from 1100 B.C. to 700 A.D. there must be a very large cemetery somewhere. 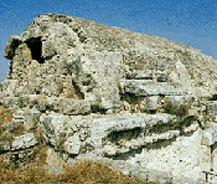 The necropolis is an area of about 2 square miles and extends from Yenibogazici in the north to Tuzla in the south. The kings of Salamis were buried in large tombs, and in all about 150 have been excavated. However, only about five are on public view, for when archaeologists complete their excavations t he site, unless it is of spectacular value to tourists, is covered up, to put a stop to looting. The local villiigers have looted these tombs for years and in some cases tunnelled right into the arnound, but they were not always successful. This necropolis is of far more importance to archaeologists than the spectacular site of Salamis, so beloved by tourists. These tombs have yielded rich treasures in the form of vases, ornaments pieces of carving and decorations that reveal much more about the life of ancient times than of the ravaged site of Salamis. Hence, this site lacks much appeal to the tourist, though on this site there is a small museum containing some grave goods. Many of the Royal tombs are seen on the surface as huge mounds, or like a big tumulus, the matrix of which is made of mud bricks. Below this is a chambered tomb, built of very large stone slabs, hence the term megalithic tomb. Whether the famous King Teucer, founder of the city, is buried here is still in doubt. In 700 B.C. the Assyrians dominated Cyprus, to be followed by the Phoenicians, and then the Egyptians from 560 B.C. to 525 B.C. Each royal tomb has a sloping carriage way leading down to the stone chamber where the king was cremated on a funeral pyre. It was the custom to have a few slave burials with the king. Outside, one usually finds the skeletons of horses and the remains of chariots. All around are large amphorae containing the incinerated remains of the dead. Many small jars contain the inhumated remains of infants. Interesting finds are the bronze blinkers, badges, head bands, and bits from the horses and amphorae which once contained cereals, fruit and olive oil. The tombs have all been numbered, and in particular, tomb 79 produced the richest amount of goods. Here was found a wooden throne decorated with ivory plaques, a large bronze cauldron decorated with griffin, curved bones, figurines, and many decorated amphorae and pots. All the grave goods are in the museum in South Nicosia, but the small museum nearby gives one a good idea of the extraordinary achievements in art more than two thousand years ago. From other tombs come decorations and ornaments showing pictures of Egyptian sphinxes and various gods of ancient Egypt .The very large mound, which forms such a conspicuous physical feature for miles around, is tomb No. 3. It is a beehive mound made of mud bricks, and long ago some villagers tunnelled into the centre of the mound, but failed to find the tomb. The place of burial was off-centre and archaeologists believe that this was done purposely by the ancient tomb builders to deceive would-be looters. What more could the ancient Romans of Salamis have wished for! Here was a vast array of royal tombs for them to use as their cemetery. Much was looted and cleared away to make room for Roman sarcophagi to be dragged in, and many tombs show the niches built into the underground chamber for their installation.